There exists a widespread rendezvous system in Germany which proposes a coordinated cooperation between paramedics and emergency doctors in case of emergency. However, the emergency doctors can also be late on site, e.g. due to heavy traffic, distance to the operation site, especially in the rural areas, and/or by the occurrence of several emergency cases at the same time. Actually the time to provision care is regulated by law at the Federal State level differently. 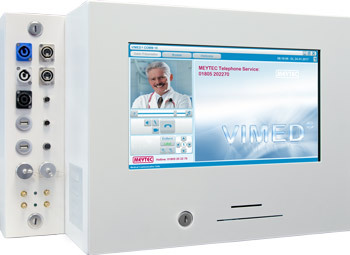 VIMED® CAR 3 is a telemedicine communication hub for ambulances. It is especially developed to support the time critical rescue missions of paramedics on site. The telemedicine communication hub VIMED® CAR 3 can contribute to the significant stabilization and/or enhancement of the prehospital emergency services when it is integrated into the rescue chain of the emergency services. The integration includes installation of the several external LTE/UMTS/WiFi and GPS antennas as well as microphones. VIMED® CAR 3 has integrated LAN, WiFi and Bluetooth interfaces through which the different medical diagnostic and lab devices can be connected allowing the diagnostic data to be transmitted from the ambulance into the external medical center of expertise. The most significant advantage of VIMED® CAR 3 is that it can be retro fitted to existing emergency vehicles. VIMED® CAR 3 helps to bridge the capacity bottlenecks in the emergency care effectively.